Authors: Smirnov V.М., Sveshnikov D.S., Kirich и к V.F., Myasnikov I. L, Kuchuk A.V. All articles of the authors: Sveshnikov D.S., Smirnov V.M., Myasnikov I. L., Kuchuk A.V., Kirichuk V.F. Authors: Popkov V.M., Zavyalov A.I. All articles of the authors: Zavialov A.I., Popkov V.M. Authors: Kirichuk V.F., Googe LA., Rosalieva Yu.Yu. All articles of the authors: Rosalieva Yu.Yu., Kirichuk V.F., Googe L.A. Authors: Kargina L.V., Dorogoykin D.L., Rodionova T.I., Utts I.A. All articles of the authors: Utts I.A., Rodionova T.I., Kargina L.V., Dorogoykin D.L. Authors: De Castro Rossi L.C., Dalben I., Mangini Bocchi S.C.
All articles of the authors: Mangini Bocchi S.C., de Castro Rossi L.C., Dalben I. Authors: Kazantsev A.M., Korymasov E.A. All articles of the authors: Korymasov E.A., Kazantsev A.V. 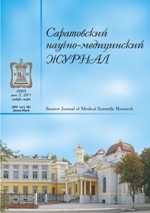 Authors: Popkov V.M., Ponukalin A.N., Maslyakova G.N., Tsmokalyuk E.N., Bucharskaya A.B., Shirokov A.A., Burov A.M.
All articles of the authors: Tsmokalyuk E.N., Shirokov A.A. , Popkov V.M., Ponukalin A.N., Maslyakova G.N., Burov A.M., Bucharskaya A.B. Authors: Konjuchenko Е.А., Ulyanov V.Ju., Puchinyan D.M., Karjakina E.V. All articles of the authors: Uljanov V.J., Puchinyan D.M. , Konjuchenko E.A., Karyakina E.V. Authors: Zelenyak К.В., Serebryakov A.B. Purpose: to compare traditional and miniinvasive approaches to total knee replacement. All articles of the authors: Zelenyak K.B., Serebryakov A.B. Authors: Barabash А.Р., Rusanov A.G., Barabash Yu.A., Alfimov R.A.
All articles of the authors: Rusanov A.G., Barabash Yu.A., Barabash A.P., Alfimov R.A.